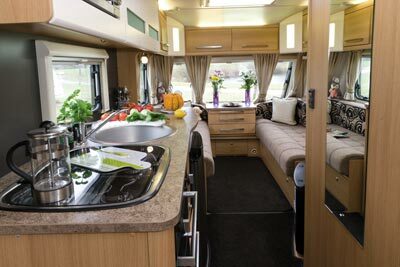 Many caravans have a twin-lounge layout but not all boast as large a kitchen as the 515. This amount of storage plus the fact it has beds for five, a full-length lounge and a separate shower make it feel more spacious than its five and half metre length would at first suggest. It feels bigger because of it has a lounge at each end – a design that allows kids to have their own space. The amount of kitchen storage space comes in the form of a floor-level cupboard with two shelf areas plus two good-sized drawers. Upper storage is great, too. The two cabinets are deep and wide. One’s fitted for plates and mugs and the other is just a great big, useful void. The shower compartment, with its separate shower and substantial bi-fold door that glides on robust runners and its ample space for washing and dressing is enough to convince you, yet again, that the 515 achieves a lot in a short length. Quality is evident in every bit of every component you look at. 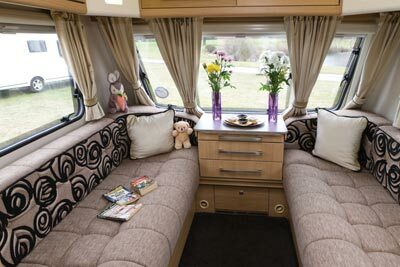 Hinges are huge, catches are there to ensure none of the top lockers dares to spring open if you encounter a vicious speed hump and we found the wide apertures of the drop-down doors to the under-settee lockers made getting bedding in and out easy. Though its light colour scheme are factors in making this caravan look larger than it is, the main reason is the shape of the wardrobe, angled to create more floor space and minimise the effect of inevitable bulk of the shower room and wardrobe that conspire together to cut a layout like this into two sections. Despite the angled shape, the wardrobe is enormous. 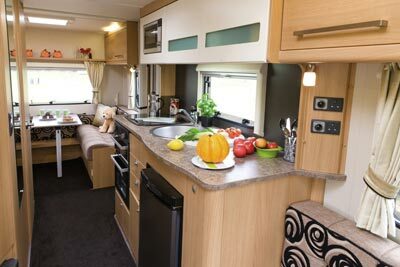 The caravan sleeps five on a double at the rear plus a bunk and two adult-length singles or a double at the front. The rear can be left made up as a bedroom or used as a big, open-plan family holiday environment where each age group has its own space. The chef among you gets plenty of space in the middle too! Elddis also offers BPW’s iDC as an optional extra on the Avante. If purchased this clever piece of kit that is designed to prevent snaking will not only add piece of mind whilst towing but will also bag owners a sizeable caravan insurance discount. The Avanté range is light, bright, modern, inexpensive and practical. You get a lot for your money in a 515 – a lot of space, a lot of build quality and a lot of flexibility in how you can use the caravan. Regrettably purchased a new Avante 2014 model….oh how I wished I hadn’t, they sent mine out with a hole in the roof;so much for Solid construction.Now awaiting the hassle of having to arrange a repair and major disruption to my touring schedule this autumn and winter;a beautiful caravan ruined by poor workmanship and even worse customer services. We’re sorry to hear that – hopefully your new Avante will be up and running in no time. Must admit our 515 is a superb caravan in layout, the quality of materials etc it’s just shoddy workmanship that let’s it down.All the problems withe our caravan could easily have been avoided by a properly managed quality control program.Perhaps Elddis should sign up for an ISO form of quality control/audited management system including real PDIs not leave it to the customer to discover and rectify faults-not 100% foolproof but better than the systems in use at present. Having finally been freed from the defective Swift Major purchased last year by rejecting it we have recently purchased another brand new van an Elddis Avante 515.We have just brought the Avante back from the dealers for the THIRD time as the toilet wall had again come away from the floor after being previously repaired-the end bed pull out front support separated-the shower wall started to split, possibly because of excessive movement in the floor adjacent to the toilet compartment and the water pump leaked.Retailer had the caravan for nearly five weeks for the last repairs! Good enough they replaced the water pump but have just glued a bit of batten on the floor to wall joint to secure toilet wall-floor still moving so we’ll see how long that lasts.The toilet door lock only engages in the keeper by approx 3mm and the gap between door and frame you can almost see through! The split shower cubicle wall was replaced with a new panel during this time and the bed end support had a small strip of wood screwed & glued to it as additional support.As a matter of interest we used the grill for the first time and the underneath of the worktop became so hot I think it will separate soon or indeed burn-anyone else have this problem?Why do Elddis spoil an otherwise nice caravan by sloppy and defective workmanship and an obvious lack of quality control management. Purchased brand new Swift Major4SR from Torksey Caravans April 2013 it had 18 faults went back to dealer but repairs totally unacceptable.Caravan went back to Swift twice for repairs, still not corrected,came back after second time with scratches to front window and sunroof.Dealer of no help whatsoever and Swift not a lot better, eventually Blackhorse helped by rejecting caravan and giving us full refund.We were only able to use van for two weeks out of six months of the summer.Moral if not repaired on first return reject it and claim compensation. We were told many years ago by a friend who had owned a variety of caravans that the PDI was done by the first owner! Since 1984 we have owned both new and second hand caravans including a 2007 Compass Corona bought new in October 2006. This caravan had a variety of minor faults and one major one. At the second service water ingress was found and repaired under warranty. The caravan was excellent after this. I would stick with the caravan and work with the dealer. Bought Odyssey 524 new 2011 Nothing but trouble with it. Fault after fault after fault. Water leaks. All the connections burst, water in the caravan, soggy carpets. Cracked shower roof. Ladder for bunks fixing not fitted at correct height. Top bunk material damaged from new. Just found out on first service 40% water over fridge/sink area from roof to wheel arch. Fire loose. No curtain fittings on bunks. Snagged cushions. Carpets fell to pieces immdiately. All the backing came off. Light fitting over front window not enough screws in kept falling off. Kitchen draw botton not correct size. Sink hinges paint off. Bent waardrobe rail. Faulty jockey wheel. Light near door faulty. Small table kept coming out of cupboard. Not enough fixers in.. The list is endless. It goes on and on and on. We would not buy another Elddis van. Had many over the years but this one has finished us off. This is my second Elddis caravan the first was bought from new and found to be great value for money and had lots of happy holidays, Now the second one which is a advante 515 also bought from new, where do I start with the faults from the minor ones such as no curtain rail ends, so when arriving at site all curtains needed to be popped back on, to the more serious ones like a gas leak and more recently a water leak, all in the first few months. In total We have had over 20 faults on this caravan. Iam seriously losing faith in Elddis. Our problems are still continuing after a number of weeks and is now on the point of heading for the financial ombudsman. R Chilcott – is the fan coming on after the grill is lit? Its what keeps the gas lit. If not then the problem is that the fan isn’t working and needs replaced. I have been informed that Elddis are having a number of problems with faulty fans in the grill. Me thinks you have been lied to! They appear to be hell bent on trying to patch and botch things rather than take responsibility for poor quality fixtures and fittings. Good luck! we have just bought a firestorm 505 2004 its 110% fab great value and i would buy another no prob. dp. I am in total agreement I bought a new 554 47 different problems and failures. Dealer thought these problems were fixable and could not see any issues last issue was water egress. Whilst I was down at the workshops one of the maintainace staff was telling me he was rebuilding an elldis explorer that was 4year old due water egress bought in December11 sold Feb 12 at NEC lost a bit of money but lost all my stress, really poor build quality now own a peggasus 2 very happy. How do you say they are lousy??? 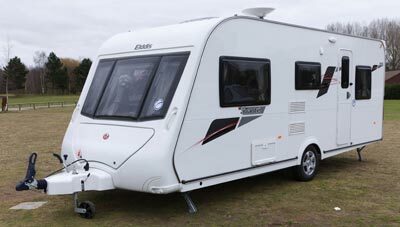 We have had 4 Elddis caravans over the years- the first 3 no faults at all – the last one (not this model but similar) had 16 faults on delivery and continued to deteriate – Never again!! A very asthetically pleasing caravan but sadly had nothing but problems since the day we picked it up, from very minor problems ( and there are a few) to a faulty ‘T’ piece at the hot water heater resulting in a large amount of water leaking into the van, and the toilet wall coming away from the floor. not a happy bunny! Hope people are having a better time with theirs than we are!